Now that #BladeHasFallen, it is time that #FeesMustFall. By OLIVER METH and BUSISIWE SEABE. It’s with great joy and jubilation that we hear that Higher Education Minister Blade Nzimande has fallen. President Jacob Zuma’s axing of Nzimande comes as no surprise. Nzimande did nothing for the sector and addressing students’ grievances and we doubt the newly appointed Hlengiwe Mkhize would do any different. 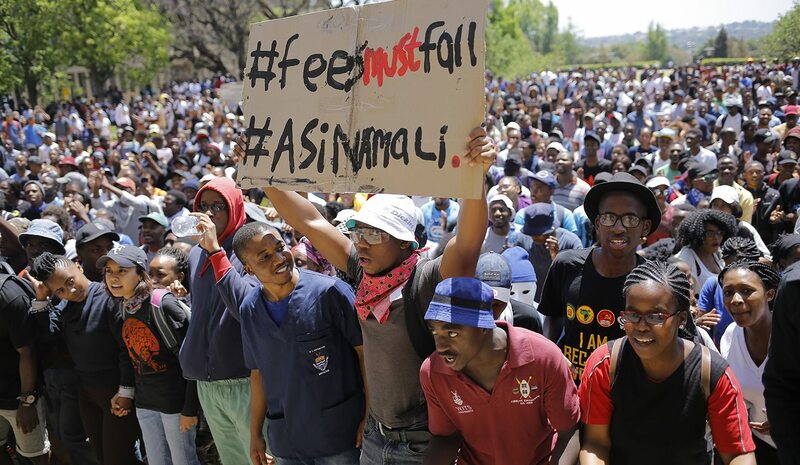 With #FeesMustFall entering its third year of protests since it took a strategic retreat, one notes that the major motivation behind this move is in anticipation of the Fees Commission Report that was finalised and released to the President. Regardless of the commission’s report and recommendations, it is important to understand the realm of power that free quality decolonised education will be delivered from. So, regardless of Zuma’s Cabinet reshuffle – whether it’s axed Higher Education Minister Blade Nzimande or newly appointed Hlengiwe Mkhize at the helm of this ministry – the question still remains, who possesses the power to call for fee-free education other than President Jacob Zuma communicating such a decision through his ministers when exercising power? The higher education landscape did not experience any different trajectory under Nzimande and surely will not under Mkhize, who served under the department in 2011 with no good story to tell in relation to their attempts at redressing the injustices of the past and our present challenges. Today, historically disadvantaged institutions continue to receive very little support from the government and have continuously dilapidated infrastructure, student services that continue to place the black child in an inferior position in all spheres of development, and financial freedom. Thus the struggle for the decolonisation of education and ridding it of its class, racial and gender biases which arose from our past is one that only the President is at liberty to deliver. The ANC has a standing resolution taken at its Policy Conference earlier this year, on fee-free quality education, to be rolled out next year – a very ambitious time frame, taking into consideration they could not do it in 23 years of governance. Nevertheless, the executive powers lie with Zuma and no minister can approve any policy without his authorisation, especially when that will have a huge impact on the state budget. Therefore the call for fee-free education falls outside Nzimade’s powers, as much as they do with Mkhize. The delay in making the commission’s report public for stakeholders to engage on proposed plans is evidence that the ministry, which is part of Zuma’s faction, is merely using students’ struggles as a pawn in fighting their party poli-tricks. This is a clear tactic of political repression in higher education and as a result we could see more sporadic student revolts across campuses. Zuma has undermined the ANC’s standing policy resolution as well as the inquiry into feasibility, by not sharing the commission’s findings and paving a strategic roll-out plan. Chairperson of the commission, Judge Jonathan Heher, presented the report to Zuma more than two months ago. To date, the Presidency still claims Zuma is studying the report and its recommendations and would make it available to the public. The bizarre speculation that the new minister will pronounce on this is not worth celebrating, as axed minister Nzimande lacked those powers then and so will Mkhize. Students are not interested in the ANC’s infighting, but will not sit back and allow their struggles to be used as Brownie points. We are resolute, undeterred and clear in our call for fee-free decolonised Afrocentric education. Regardless of who Zuma moves around on his chess board, it’s still unclear whether there would be fee-free education for the poor by 2018. Yet, instead, the rhetoric, as a dangling carrot, in favour of Zuma’s factional battles will extend to another year and be used as a campaign tool for 2019, and not get implementation thereafter. One can anticipate, if Zuma’s preferred candidate Nkosazana Dlamini Zuma loses in her bid for the Presidency, that before early advised retirement he will declare fee-free education while there is no budget, so that people will say, “We told you about (Cyril) Ramaphosa”, having a huge negative impact on the movement at large. He ought to demonstrate now if and how fee-free education would be rolled out before the outcomes of the December elective conference. If he decides to do that, it will be Zuma who has been delaying it all along and NOT ministers. Meth is a Wits University student with a research focus on the Fallists’ movement and contributing author of latest publication #Hashtag: An analysis of #FeesMustFall at South African universities, published by Centre for the Study of Violence & Reconciliation. Seabe is a Wits University Fallist activist and contributing author of Riot & Writing: Diaries of Wits Fallists, published by Society, Work & Development Institute. Photo: Students from Wits University demonstrate on campus during a fourth week of clashes with police forces during protests against the cost of higher education in Johannesburg, 10 October 2016. Photo: Kim Ludbrook/(EPA).